« August 12th: Out into the unknown! We started today off in Ashtabula County, OH, where they have an unhealthy obsession with covered bridges (which Becky can’t stop inadvertently calling “covered wagons” — too much time playing Oregon Trail?). 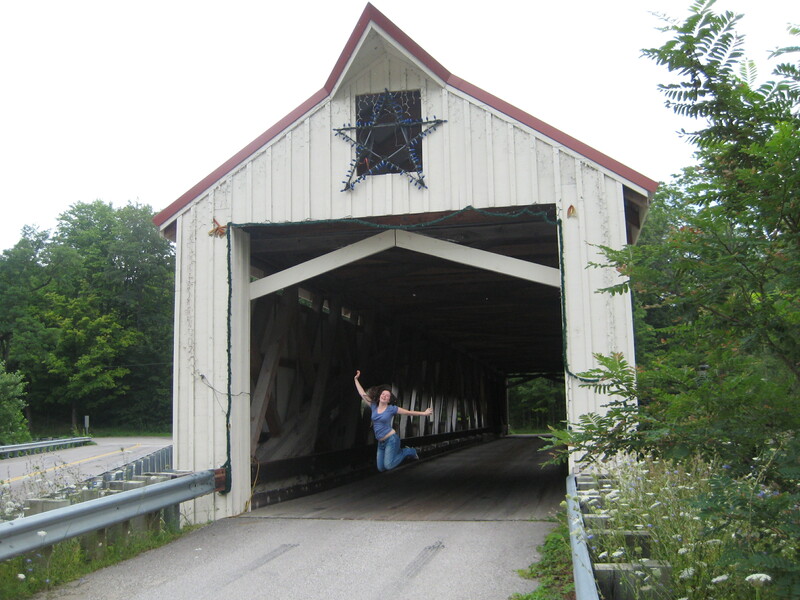 Becky is *really* excited about covered bridges. From Ashtabula, we made our way west to Cleveland, and stopped by the Rock and Roll Hall of Fame and the Cleveland Museum of Art (many galleries of which were closed for renovation), and wandered the parks outside the museum. 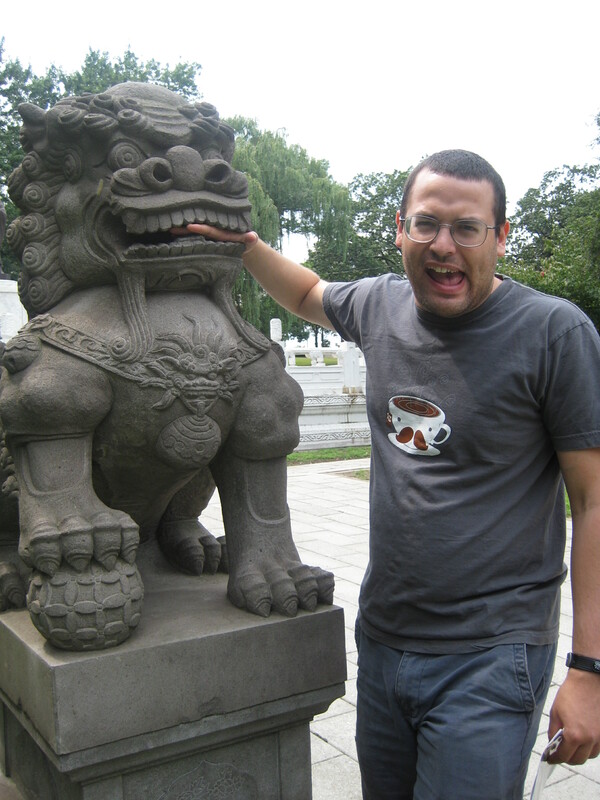 We were delayed when Jonathan was attacked by a Chinese dragon. On our way west toward Chicago, we once again abandoned the interstate for some more rural highways. They got primitive real quick as we approached the Ohio-Indiana border, turning into a dirt road which we discovered ran right along the state line. More interesting was the horse-drawn buggy that happened to be driving down the road at the same time as us. Apparently we had wandered into Amish country, and there were many more buggy sightings over the next couple hours. 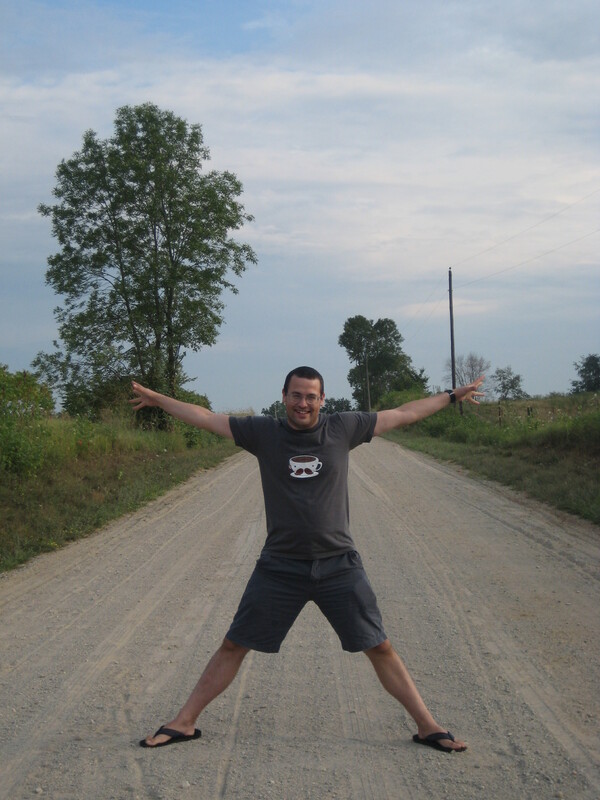 Jonathan straddles the state line like a champ. This entry was posted on August 14, 2008 at 1:32 am and is filed under Uncategorized. You can follow any responses to this entry through the RSS 2.0 feed. You can leave a response, or trackback from your own site. Whoa! Becky! Nice ups under that bridge!